Adding a couple of great pillows to a room can completely transform a drab space into a bright, sunny place you want to spend time in. 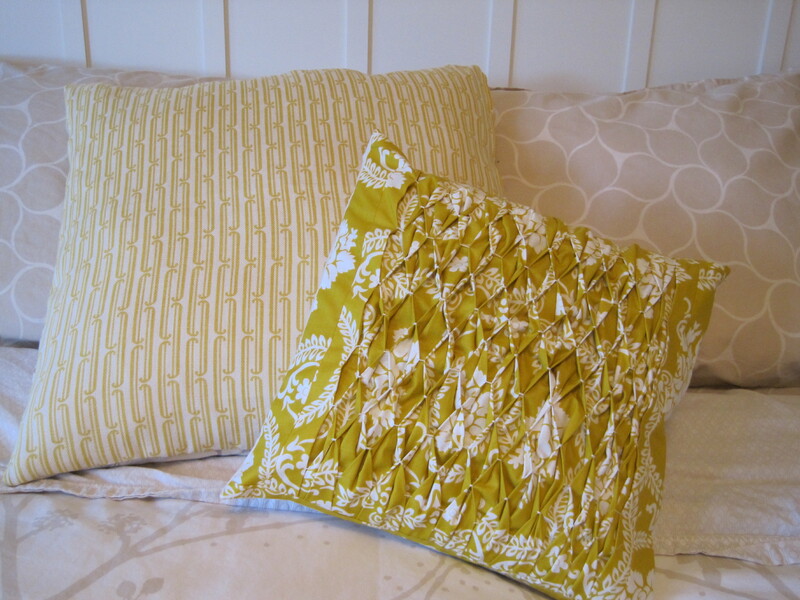 These two pillows were made with the intention of brightening up our monotone bedroom. I’m a huge believer in adding a bit of yellow, and my theory worked perfectly this time! The first pillow was made from two fabric napkins that my mom bought for me from Dwell Studio. The pillowcases they sold were way overpriced, and my mom knew I could make one easily from the napkins (she was right!). This pillow whipped up in no time at all. I took pictures of the process and will post a tutorial soon for this washable (zipper closure) pillowcase. The smocked pillow was started on Wednesday evening while watching Glee (guilty pleasure…). It took a lonnnnng time to make, but I’m super happy with the end result. The tutorial for honeycomb smocking can be found here. If you decide to give this a shot, I sure hope you like tying knots more than I do! Does anyone have any good tips for quick knot tying? We’re talking every single tack needed a knot at the start and the end…not fun! This was such a satisfying project [mom stop reading now], and I’m sure my husband will agree that it’s not a bad thing to want to spend more time in the boudoir! Beautiful pillows! The smocking may have taken a while, but the end result is just lovely. 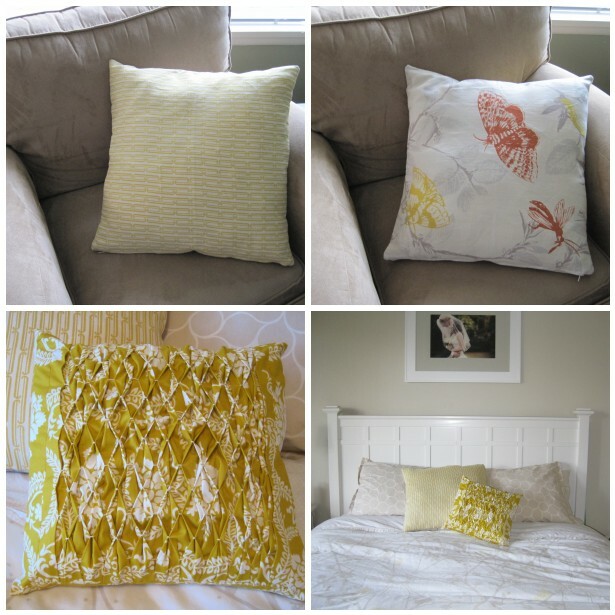 I love the honeycomb pillow! pillows can so change everything!!! and they can be finished often much quicker than quilts! Sarah, you are too talented. I’ve always dreamed of learning how to sew using a sewing machine =) I can only do basic things like sew up a hole in a shirt or sew on a button. Your Etsy items are so lovely.